Clint Eastwood is back, in more ways than one. Having been absent from our screens since 2012s Trouble with the Curve (although an uncredited appearance in American Sniper could also be counted) and after the disastrous The 15:17 to Paris last year, he is back on form as director and as the star in this strange true story of how a 90-year-old gardener became the most wanted drugs mule in America. Earl Stone is a man who has spent his life working with and selling plants, even to the point of forgetting his family. With the internet stealing his custom, Earl is short of money until a chance meeting leads him to become the perfect drugs mule of a Mexican cartel. Perfect because he has never had a ticket, he is polite and friendly to the police, and no one would suspect him of being involved in such crimes. Yet the DEA, without a clue as to his identity, want him badly. Having just had Robert Redford’s The Old Man and the Gun as a minor hit, the thirst for ageing criminal behaviour seems flavour of the month. With a script from Gan Torino’s writer, Nick Schenk, this enjoyable and surprisingly funny tale has Earl as a gentle old man who struggles with modern technology. He hates the internet and has no idea how to text, yet finding himself in desperate need for cash to save his home and to show a little support to his granddaughter after letting down both his ex-wife and his daughter in the past. This is the American Dream gone wild. A perfect foil for delivering drugs across the country, Earl doesn’t have a clue what he is doing, except driving, a thing he has done all his life. The cartel is not happy with his relaxed views, the soon becomes their best mule, transporting millions of dollars of cocaine and picking up a brown envelope stuffed with money. Mixed into the tale of Earl and his newfound love for life are DEA officer Colin Bates and his desperate attempts to break the cartel. Along with his partner, the pair, with the help of a reluctant snitch, follow events without ever knowing the identity of the mule. 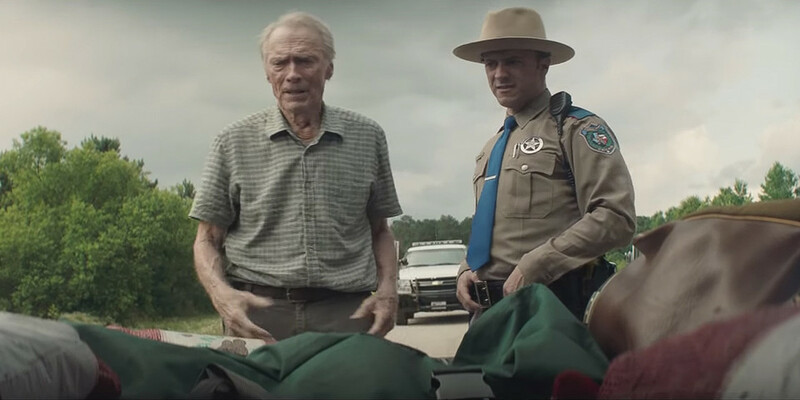 Eastwood’s relaxed filmmaking style works well here, and we get to see a much lighter Clint than before, singing along to the radio as he drives through the various landscapes of America. While the sexual politics might be dubious (a party in the cartel’s home looks more like a swimwear advert), you can forgive it as the film moves into a more dramatic mode for the final section, as family tragedy interferes with duty. The cast all are fine, with Bradley Cooper as Bates, is perfectly amiable while Michael Pena as his partner adds depth to the partnership. Dianne Wiest is particularly suitable as Earl’s disgruntled ex-wife. Yet this is Eastwood’s film. Even at the ripe old age of 88, Eastwood still manages to command the screen and here he seems to really be enjoying his time in front of the camera. He still can deliver a killer line when he needs to, and you warm to this grumpy old man, so much so that when things turn sour, you feel for him. The Mule is a thoroughly entertaining film that works thanks to Eastwood’s screen charisma. It has been accused as a slice of propaganda to Trump’s wall, but I couldn’t see that. Instead, I saw a film with a Hollywood legend that reminds us that age shouldn’t get in the way of having a good time.